will make you charming and confident when attending any party or activity. Material: Polyester net and feather. Headband nomal width: 12 cm/4.7 inch. The headband is adjustable, it can be stretched the size you want to fit any head size. One size fits all. (please note: F series without any headband, only non-detachable hair clip ). *Fascinators are women's best hats accessory, also it matches clothes well, are important partners for ladies when joining any party or activity. *Great gifts for daughters, sisters, girlfriend, wife, mothers, girls, ladies, women, friends etc. 1. 1-3cm size difference is in normal range due to manual measurement. 2. Actual color may vary slightly from image, due to shooting angle or light, screen resolution etc. Please understand, thanks. If for any reason you are not fully satisfied with our product, just contact us directly and freely, you will get a full refund, no problem. HIGH QUALITY: Handcraft finished, made of cambric and feathers, with removable hair clip and headband, so you can wear the headband or clip it into your hair, it will stay in place all day and make you noble and confident. COMFORTABLE AND ELEGANT: Simple to wear, hat shape fascinator, pretty, adorable and fashionable. 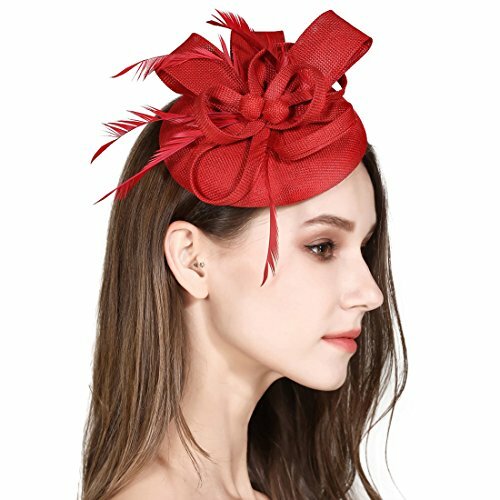 It is a cute and delicate fascinator which is NOT big enough to cover the whole of your head, you will not feel heavy wearing and no need to be annoyed to wear a hat when you attending any activity. But you will become charming and get a lot of compliments when you wear it on head. PERFECT FOR ALL OCCASIONS: Wedding, photography, prom, church, ascot races, royal banquet; All kinds of parties, such as costume party, cocktail party, high tea party, bridal shower tea party, hen party, a derby party; Even for Halloween decor, Christmas events; Suitable for any special or casual activities. BEST GIFTS FOR: The feather fascinator will be a great choice for girls, ladies, women and mothers. It is the best present for your girl friend on Valentine's Day; For your wife on a Wedding Anniversary Day or birthday; For your mother on Mother's Day; Suitable present for any girl,friend or woman on her birthday, party or activity needs. 100% SATISFACTION GUARANTEE: If you are not satisfied with our item, just contact us freely: replace or full refund, any solution is ok. We will give customers 100% satisfaction guarantee for sure. If you have any questions about this product by HOLDOOR, contact us by completing and submitting the form below. If you are looking for a specif part number, please include it with your message.